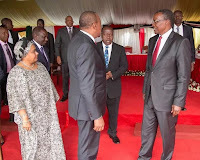 Thursday September 6, 2018 - President Uhuru Kenyatta will meet with Chief Justice David Maraga to discuss how to have good relations between the Executive and the Judiciary. According to sources, Uhuru who is still in China will meet Maraga amid deteriorating relationship between the Judiciary and Executive. The meeting comes a week after Deputy Chief Justice Philomena Mwilu was arrested over corruption related offences. Mwilu was arrested and charged with tax evasion among other economic crimes in what she terms as a 'fixing scheme' by the Executive. The meeting also comes at a time President Uhuru Kenyatta has instructed top National Intelligence Service (NIS) officials to investigate top Judges who are accused of receiving bribes and who are involved in money laundering. The venue of the meeting between the two is a closely guarded secret but sources said it will be at State House, Nairobi.